Marie-Armance Renaud, who was recently called to the Bar at Inner Temple, shares her experiences on how JustisOne can be used to conduct the research needed to build a strong argument after identifying a key decision. As someone who has recently been called to the Bar, it is increasingly important that I prepare the strongest argument possible for court as I undertake pro-bono work. As an important legal skill, learning to build an argument is something that every student should be equipped to do, and the skills that I developed during my time at university have been a very important foundation for this. However, the more experience I have, the more I am aware that the best way to prepare an argument is to look for ways to reinforce those key points an argument relies on by properly utilising the wealth of information available on legal research databases. Finding a starting point for research is simple enough, with landmark cases being easy to identify if they aren’t already known. To reinforce the arguments that those cases lead to, however, means examining how subsequent cases have treated it and exploring the common relationships between those cases for other relevant material. It is also important to identify the relevant passages within numerous judgments that cite the cases you are interested in. This is time-consuming work, but it is essential in developing a strong argument. Conducting thorough legal research is the only way to ensure that an argument is as strong as it can be, and there are no shortcuts to doing this. However, it is possible to make the process of conducting this research more efficient. JustisOne is an intelligent legal research platform which has led to me spending less time finding relevant cases to support arguments, which gives me more time to synthesise information and draft my arguments. To provide an example of how JustisOne makes legal research more efficient, I will use the following broad problem related to my pro-bono work: My client claims to have been unfairly dismissed by his employers and I know that Malik and Mahmud v Bank of Credit and Commerce International S.A., referred to below as Malik and Mahmud, was a landmark case about the implied term of trust and confidence that exists between an employer and an employee. Firstly, I need to determine if this case will support my client’s case. If it does, this case will prove important, but my argument around it will need strengthening. To do this, I first look at how to extract the key information from this case, and how influential it has subsequently been. How do I identify the important passages in a case, and see which cases have subsequently quoted passages I am interested in? 1. To approach this topic, I first need to determine whether the employers can have reasonable and proper cause to justify their conduct, which my client argues effectively destroyed the relationship of confidence and trust between the employer and themselves. When I view the Malik and Mahmud case within JustisOne, I quickly discover that the first purple passage on the left of the screen seems to answer my question. These purple passages are known as Key Passages and represent the most frequently subsequently quoted passages of a case. I click on the passage which is then highlighted within the full text of the case, which allows me to read the context around the passage. 2. From there I continue reading and realise that a few paragraphs later, another passage is of interest to me. However, it is not one of the key passages on the overview page, but I want to find out whether this passage has been subsequently referred to. By clicking on the ‘highlight all quoted passages’ button, I am not only able to see the key passages of this judgment but every single passage of the Malik and Mahmud case that has been quoted by subsequent cases. The passage I am interested in is coloured in deep purple, which means it has been more frequently quoted than others in the judgment. 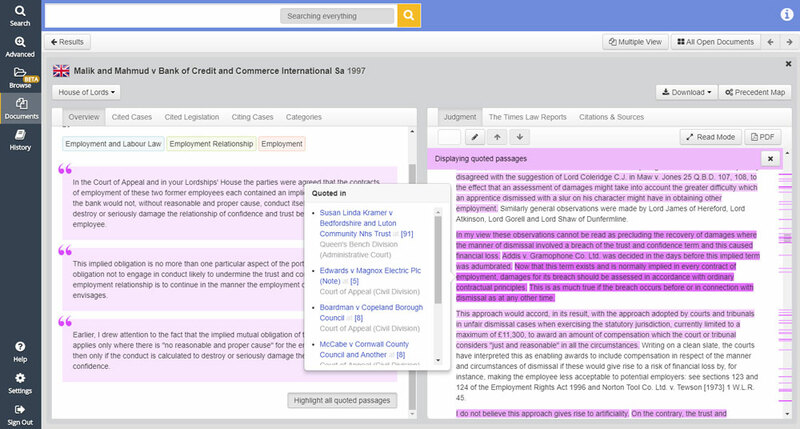 Clicking on this specific highlighted passage will then display which cases have referred to it, as shown below. This feature is cross-jurisdictional, meaning I can view references from over 25 jurisdictions. When I click the paragraph number corresponding to a particular case, JustisOne opens that case and displays the reference in context. These cases can be opened side-by-side to make my comparison task easier. How do I quickly understand which decisions are important for a case? In order to determine which cases were cited in the Malik and Mahmud judgment, I click on the cited cases tab, which also gives details of how these cases were treated in a clear way thanks to the traffic light system. Within the three broad categories of positive, neutral and negative, there are 14 specific treatment types which let me know exactly what treatment the case received. I quickly see that the Lords here referred to Withers v General Theatre Corporation Ltd and overruled the decision of that case. The button beside the case shows the number of references to Withers within the Malik and Mahmud judgment and gives me the impression that it was discussed in some length. By clicking on this button, JustisOne displays a condensed version of the case which highlights all the references to the Withers case, enabling me to read these quickly and efficiently. The more references there are to a case the more that case will have been discussed within Malik and Mahmud, and I can prioritise my reading in that way. How do I find out which cases I need to look at next? 1. The citing cases tab offers a clear overview of all subsequent treatments of the Malik and Mahmud case, whether the full text of the case is available on JustisOne or not. JustisOne is the world’s only neutral legal indexer, meaning that it will still show case relationships even if the full text of a judgment is not available on the platform. This means I can be sure I am exhausting all possible avenues of research and feel confident that I do not miss anything out. From here, the traffic light system suggests that I first look at negative treatments of the Malik and Mahmud case, which may help in my preparation. Three cases have distinguished the decision in Malik and Mahmud, and I am again able to click on the buttons next to those cases to highlight all references to the Malik and Mahmud case in these subsequent judgments. This will save me time and allow me to conduct my comparison exercise very efficiently. 2. Having retrieved all the information I need from Malik and Mahmud, I notice that in the citing cases tab there was another case that involved the collapse of the same employer, Bank of Credit and Commerce International Sa (In Liquidation) v Ali (No. 3). To further explore the relationship between this case and the Malik and Mahmud case, I open the precedent map in order to highlight the common relationships between the two cases. 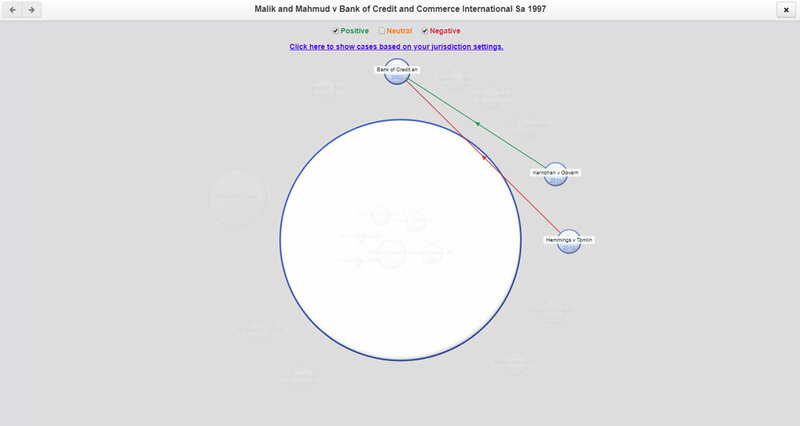 By selecting Bank of Credit and Commerce International I can quickly see that, as well as positively referring to the Malik and Mahmud case, it was also referred to by 2 subsequent cases which gave it a positive and a negative treatment, as shown below. Interestingly, these were the same treatments that these two cases gave Malik and Mahmud. This indicates that I should probably have a look at these two subsequently citing cases in my research. From the starting point of one familiar case, I have only spent a few minutes using JustisOne and have established Malik and Mahmud is an appropriate basis for my argument. The judgment has overruled a previous decision that I may want to familiarise myself with and given me a direction to continue researching to reinforce the argument that I am constructing. It has also made me aware of cases I need to read to ensure they do not undermine the argument I am constructing. If you would like to experience the benefits of using JustisOne for your legal research, you can fill in this form to register for a personalised trial, and a member of our team will contact you to set up your trial with the content relevant to you. Marie-Armance Renaud completed her BPTC at BBP Law School and was called to the Bar at Inner Temple in November 2017. In her role at Justis, Marie was a Senior Business Development Consultant, working as a Global Academic Specialist within the team.